A few years ago I wrote an article on thatgamecompany’s 2012 modern classic Journey, an indie game about a desert pilgrimage. One of this game’s main gameplay features entailed climbing on and ‘surfing’ off of dunes. This locomotive ebb and flow–as well as the game’s anonymous co-op mode–enticed thousands of players, many of whom discussed their experiences on message boards. Especially noteworthy is the game’s impression of scale: it reduces the pilgrimage to around two hours of playtime. It traces a linear direction towards the mountain in the distance. Despite this compression, and caused by the large non-playable space surrounding the player, a strong sense of width is produced. 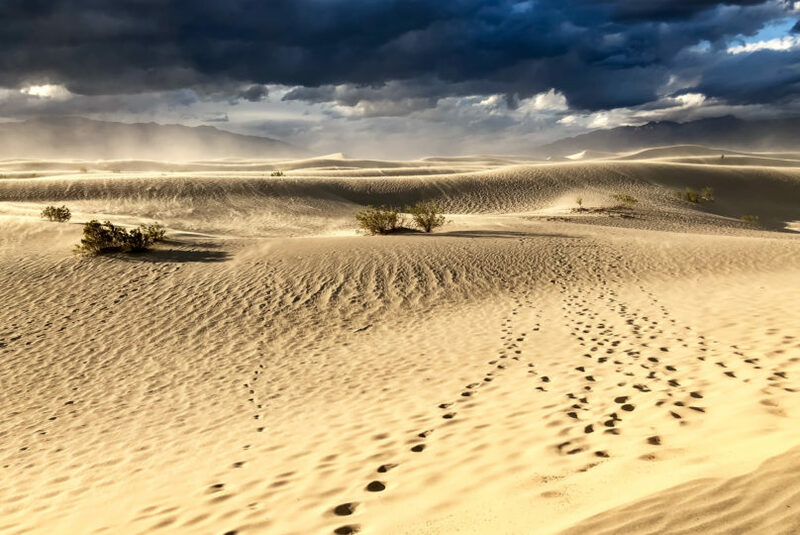 We know it when we play: the desert is a place to get lost. It stretches itself out in all directions, implying all kinds of unvisited regions. In other words, Journey does not evoke a sense of unlimited exploration: players instinctively know their purpose is to hike towards the mountain in the distance. Their trek is decisively linear, but still it suggests unbounded possibility: it feels like they simply choose a single direction in the face of this possibility. They are not just caught in a willing suspension of disbelief: they oscillate between a sense of endless scope and self-imposed directionality. 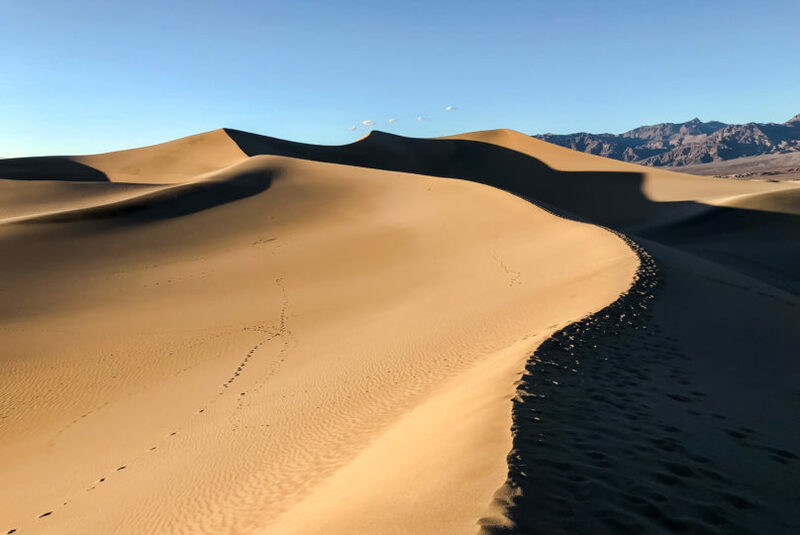 On a recent trip to the Mesquite Flat Sand Dunes in Death Valley, Nevada, I was suddenly reminded of the extraordinary experience this game’s spatial features offered me years ago. 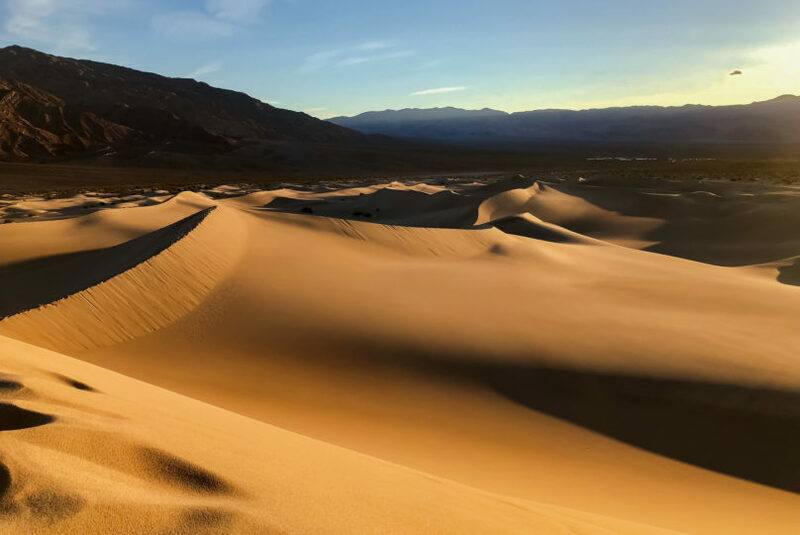 Conveniently close to Hollywood, the dunes have been used in several movies, including a famous scene in Star Wars: A New Hope in which two robots, ironically, get lost in a desert. An effect of compression similar to Journey‘s is at work here. In reality, it takes about half an hour on foot to get to the largest ridge overlooking the few square kilometers of the area. But the pictures, or the movie, might as well have been taken in the Sahara. Visiting the dunes felt like a repetition of my earlier, virtual trip. A hyperreal sensation in which the screen had premediated my bodily experience, the latter now referring to the former instead of the other way around. I felt like that digital creature I half-embodied years ago–almost capable of surfing down the hills of sand I had scaled. I climbed the highest dune I could find, my own faux-mountain. 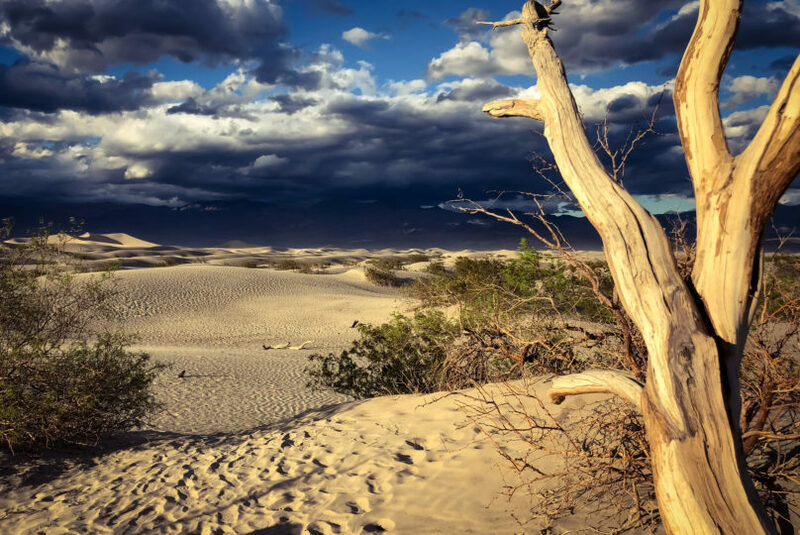 Of course we could say the Mesquite dunes’ actual, limited size makes them somewhat artificial, a fake desert. But like the desert in Journey, it is precisely their bounded nature that makes them so imaginatively potent. 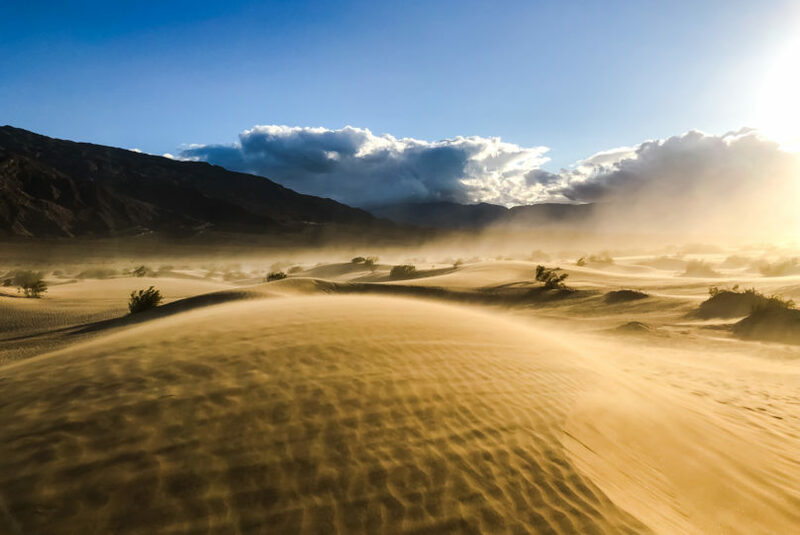 The ‘desert experience’ that both these places evoke is contained–it’s hard to get lost in these hills–but their suggestion of unbounded possibility is precisely how they invite us to engage in a creative act, Hollywood scriptwriters and tourists alike. To me, the recollection of the game triggered by the real-life experience is a tangible, bodily one. 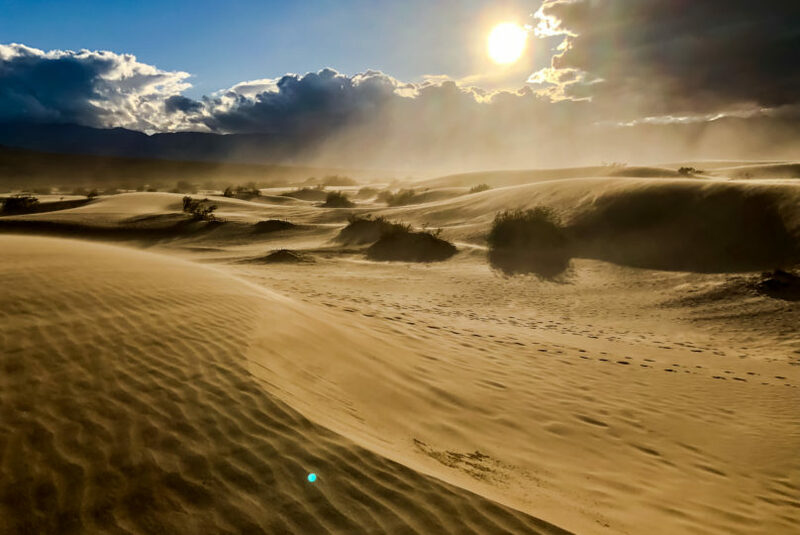 Balancing on top of a ridge, sinking away in the loose sand, feeling the resistance or give of the dune as I climb or descend: these acts trigger somatic memories, even though I used only my thumbs to move last time around.